I am two weeks late with this one, so I'll keep it short. 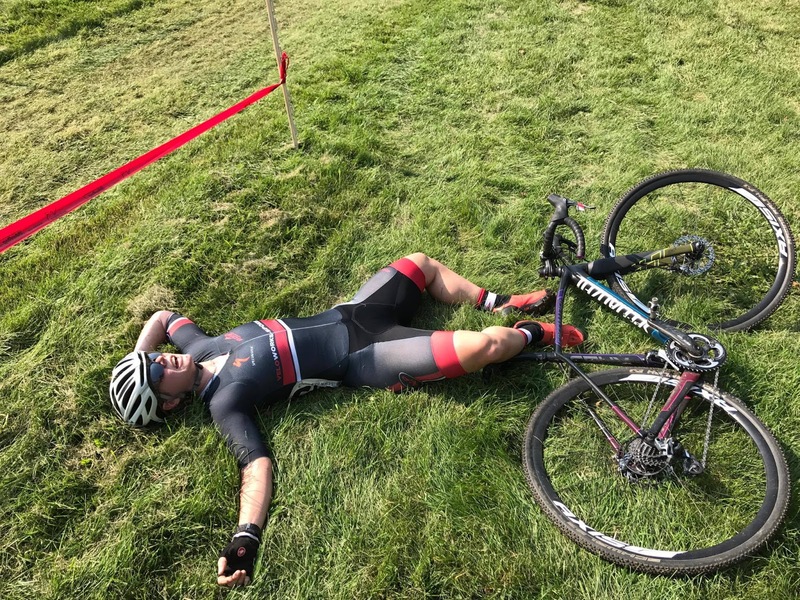 That's how I felt after this race. The course was good for me and I had good legs on the day. Unfortunately, my mechanic's skills weren't up to the level of my racing skills. The course had some off-camber turns, one off-camber descent into a steep hill (which I was able to ride if I could get the right line), some woodsy sections, one hill in the woods that would have been ride-able if the race director hadn't put big logs across it (just kidding, Joe! ), and a little pile of rocks that you could totally ride if you got the exact right line. I took the hole shot and led into the first part of the course. First time up the off-camber descent to run-up, I banged my rear wheel and heard it rattle. Ethel's rear quick release had come loose slightly. I stopped to open it, tighten it, close it. Lost about 3 places, but still had everyone in sight. Second lap, I went down in a corner that hadn't given me trouble before. Lost another place or two. Got back up and kept going. Went down in another easy corner, and heard my rear wheel rattling. Rear quick release was loose again. I'd just passed the first pit entrance, and had to go through a bunch of the course before I would pass the other side. A guy in the pit saw me looking for the pit entrance and volunteered to get my bike ready for me. I had to take all of the corners super easy because my back wheel was sliding out from under me. Entered the pit and got to switch bikes almost like a pro! Superstar teammate and former full-time bike mechanic Clay was in the pit to receive my bike. He saved my bacon on this race! On my pit bike, I tried to start making up some ground. Brakes felt a little . . . not brakey. I managed to finish out that lap, but on a tight 180 around a tree at the start of lap three, my brakes gave up, I couldn't slow down, and I went right through the course tape and into the parking lot. Naturally, this happened right in front of the race announcer with tons of people standing around. I rode a slow circle in the parking lot. I'm pretty sure there are rules against going off course like that. Was I disqualified? Could I get back into the race? Did I even want to? Then one of my friends from the local scene said, "Jamie! Don't give up! Do you want to be in 15th place?" So I hopped back on the course and resolved myself to finishing super slowly . . . Until I saw Clay waving at me from the pit! He'd fixed my A bike, and I was able to change in the pit and get back to some hard racing. My last lap was the best. I rode everything except for the uphill logs in the woods. I passed two of the women in the 1/2/3 race, which had started a minute before my race. I caught and passed a few more in my race. I was within sight of two more women in the finishing straight, but the end wasn't long enough to outsprint them. I finished 5th of 15, even with two bike changes! I was very satisfied with my racing, if not with my wrenching. It's fun to think about how I would have done if all had gone well with my bikes. I've replaced Ethel's quick releases. Once I got Fred in the bikestand back home, I discovered that one of the pads on the front brake had come loose from its backing. No wonder it wasn't slowing me down--it was steel-on-steel! I think I could have finished second, maybe even first if I hadn't had the mechanical difficulties. Ultimately, though, it doesn't matter; taking care of your equipment and arriving to the race with your bikes squared away is part of racing! Big, big, big thanks to Clay for being my pit crew, and congratulations to him for getting third place in the 35+ 3/4/5 race! Congrats also to Beth for getting 2nd in the women's 1/2/3, Chris for getting 4th in the men's 4/5, Eric for getting third in the 45+ 1/2/3! I wasn't planning to buy a new bike. But sometimes the bike chooses you. One of the women in the local 'cross scene posted her 2014 Crux Pro on the DC Used Bicycle Marketplace. It had a SRAM Red groupset, hydraulic brakes, and came with two wheelsets: an alloy clincher pair for training and a Roval carbon tubular pair for racing. She was selling it for a song, with extra chainrings, chain, and rear cassette that she had laying around for it. And it was 46 cm--my size. I couldn't not check it out! So Emily was a little surprised when she came home from traveling to Chicago for business, because there was a new bike in the stable (there are now 5). I've spent the last few weeks setting it up for me: lowering the saddle and the stem, adding new pedals and bar tape, learning how to glue (and now re-glue) tubulars onto carbon rims . . . I've never worked with tubulars, SRAM, or hydro brakes, and I still have much to learn. But after 2 weeks of tinkering, she's finally ready to race. Her name is Ethel (Fred is my pit bike). The carbon tubulars will need to wait until the next race to make their debut, because the front one flatted on Tuesday and I need to go through the process of pulling the old one off and then regluing a new tubular. I present to you Fred & Ethel, making their debut at Hub Labels CX this Sunday! Fred and Ethel, ready to race!